The Los Alamos Photo Club (LAPC) and Los Alamos Adobe Users Group (LAAUG) announce their annual photo show, April 1-April 27, in the upstairs gallery of the Mesa Public Library. Entries are accepted from anyone who lives or works in Los Alamos County or belongs to either the Los Alamos Photo Club or the Los Alamos Adobe Users Group. Club and non-club members are generally not limited to the number of entries they may submit. However, should display space not accommodate all entries, preference will be given to club members with the exception that each non- club member will be allowed to display at least one entry. Space availability has not been an issue in the past. For each picture you wish to enter, include the following on separate lines. We will make a display label using some or all of this information. If you do not provide a sale price we will put NFS on your label. Send entry information by March 29 by email to laphotoclubshow@yahoo.com with the subject line: "Description of entries for 2019 LAPC show by [name of photographer]". You should receive a confirmation e-mail within three days unless your entries are received before March 21. In that case, entries will be confirmed by March 24. Participants are requested to provide a snack item for the opening reception. At the bottom of your e-mail, please indicate what food you can bring to the April 1 opening. Entrants are free to post any additional information about their image, including information that did not fit on the display label. Create your own placard or note sheet approximately 8.25" wide by 5" wide or less to be placed below the picture. On the back of each picture make your own label with your name, phone number, email address and the title. Please include your ranking of #1, #2, #3, etc. To repeat, depending on the number of total entries, we may need to limit individual entries. Active members will get preference if we have too many entries. This has not been a problem in the past. - Friday, March 29, 2019: Entry information is due unless prior arrangements are made. If you must send entry information late, send an email to laphotoclubshow@yahoo.com with the subject line: "Request for late entry". - Saturday, March 30, 2019: Drop off your work upstairs at Mesa Public Library between 10:00 and 4:00 PM. At that time LAPC representatives will be present. You will be able to preview your image labels and make any corrections and/or changes, if needed. - Sunday, March 31, 2019: Hang work at 1 PM. Photographers are requested to hang their own pictures. Typically club members will be available to provide assistance as needed. Entrants unable to be present to hang their pictures must make arrangements in advance for an alternate to hang their pictures. Although not guaranteed, club members may be available to hang your pictures. E-mail laphotoclubshow@yahoo.com with the subject line: “Need alternate to hang my pictures” by March 29. Some hanging hardware will be available courtesy of the Mesa Public Library and the LAPC. - Monday, April 1, 2019: Exhibit opens. Opening reception at Mesa Public Library at 5:30 PM. All photographers are asked to attend the opening reception and furnish some "finger-food." 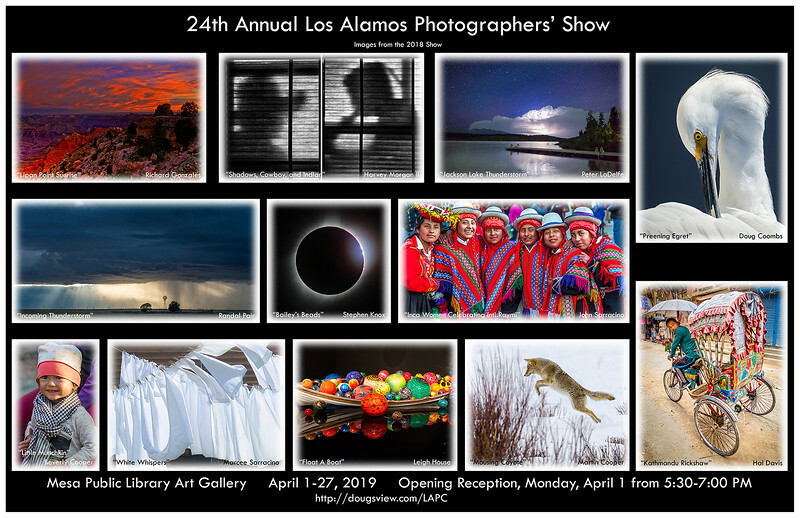 - Tuesday, April 16, 2019: In lieu of April club meetings for Los Alamos Photography Club and Los Alamos Adobe Users Group, there will be a walk-through of the show from 7-9 PM. This is a chance for the photographers discuss their work. The public is welcome to attend and interact with the exhibitors. - Sunday April 28 - Tuesday April 30, 2019: Pick up work at Mesa Public Library Gallery unless other arrangements have been made in advance. Ken Nebel/Village Arts will give a 15% discount on full framing of photos for the show as well as a 10% discount for mattes alone. Framing orders will need to be submitted no later than March 16 to ensure they will be ready by March 30.